Seen on ARCServe 11.5 (SP2) when doing a brick level restore of user data. 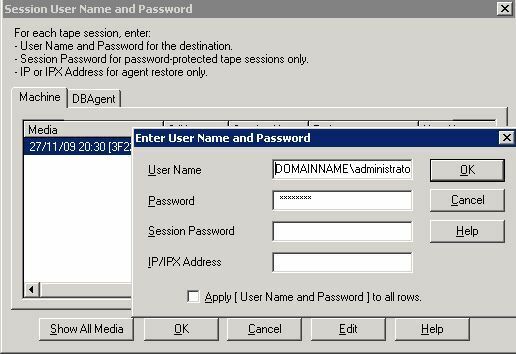 Assuming you have the correct credentials set up in ARCserve server admin, and in the ARCServe Exchange agent, Attempt to re-run the restore job, at the final stage you will be presented with the "Session User Name and Password" dialog box. 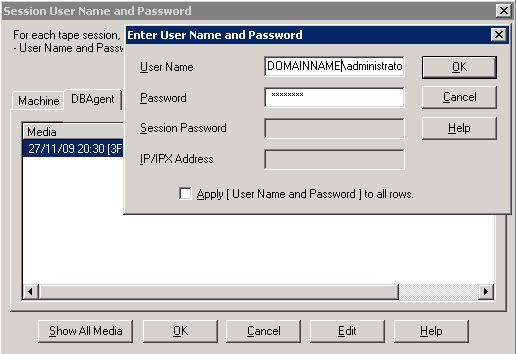 Select the job > Click Edit > Enter the credentials as DOMAINNAMEusername with the correct password > OK.
Then select the DBAgent tab, and do the same on there. The Restore should now proceed.